Synthetic Cotton Rope or 'Poly Cotton Rope'. 3 Strand construction. 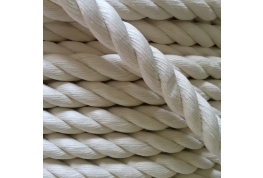 Soft to touch feels and looks very similar to natural cotton rope but will not shrink or swell when wet. Synthetic Cotton is currently available in 6mm, 8mm, 10mm, 12mm and 24mm diameters. 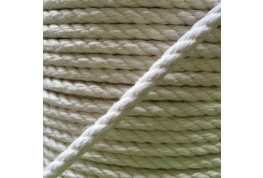 12mm Synthetic Cotton Rope. New product developed by our production team - looks and feels very much like natural cotton rope. Ideal for indoor or outdoor use. Popular as a decorative rope and barrier rope. 24mm Synthetic Cotton Rope. The perfect decorative rope or barrier rope. Suitable for indoor or outdoor use as will not shrink or swell when wet. Strong, low stretch rope with excellent UV protection.